If you’ve got it, they’ll never see it coming. The Patience and Time is the dream tool of any assassin. Inbuilt enhanced motion sensory systems allows for pinpoint tracking of your targets while aiming down sights while any Guardian who explores deeper into this weapons capabilities will find specialised systems ready to interface with the armour micro-materials. Patience and Time is a wonderful weapon for those Guardians who wish to sit back and wait for their targets to come into view. 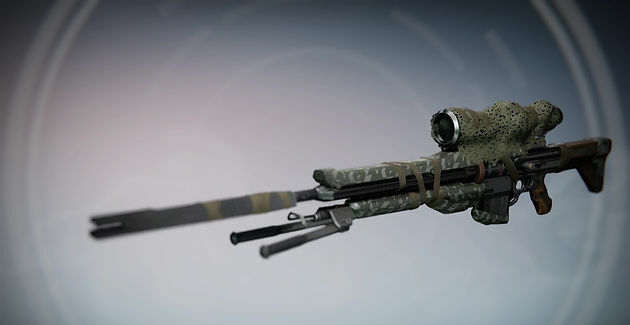 It is equipped with Third Eye which enables you to track your targets via your radar while aiming down sights and its main exotic perk, Patience and Time enables you to gain active camouflage while you aim down sights. Be warned though Guardians that this pseudo-invisibility will only activate after about a second while you are aiming down sights and will disappear as soon as you stop aiming. This weapon is definitely more of a PVE weapon as the perks will see much more use. Your Guardians ability to gain active camo, will enable you to become harder to hit, particularly against those pesky Ultra level bosses. Going invisible can give you a slight break so you can focus on hitting those precision shots and dealing as much damage as possible. In the Crucible and indeed higher level PVP activities, the active camouflage does not make you impossible to see so you can still be targeted by anyone paying attention. While it may give you a moment or two to line up your shot, it seems like an inefficient weapon to utilise your exotic slot on. The look for this weapon contains many elements that play into its role of camouflage and hiding your Guardian from unfriendly eyes. The scope is covered in a green mesh that is used by Snipers to blend in with the grasses and other elements of the environment so to avoid detection. The main colouration of the weapon is a camo green once again to serve the purpose of blending in and the barrel and muzzle are wrapped in a tape or cloth like substance so to reduce noise and suppress the muzzle flash. On top of this, this sniper has a stand which further emphasises its purpose as a weapon for those Guardians who will hang back and wait for their targets. It is designed for those Warriors of Light who have both patience and time. The Patience and Time can be gained from an exotic secondary engram or purchasing it from Xur if you are lucky enough for him to have it in his inventory.